So your current drivetrain is in dire need of replacing. Your chain has stretched, your rear mech has more play in it than a Hillman Imp gearbox, and a hen has sharper teeth than your cassette. If you find yourself on a 10 or 11 speed, 1x only drivetrain, service time might also be the best time to upgrade to 12 speed, and with new options from Sunrace, SRAM and E*13 it needn’t be as expensive as you might think. 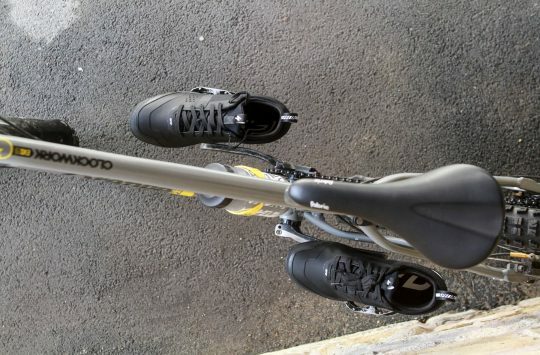 As far as we can tell this is the most affordable way to add 12 speed to your bike. 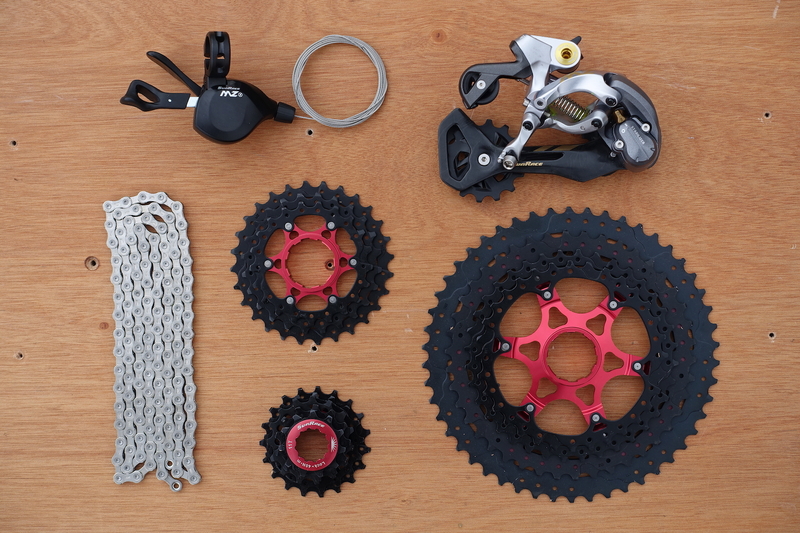 The Sunrace 1×12 MS Shifting kit includes everything you need to convert your bike from its current state to a hill-climbing machine, although you may also want to invest in a new chainring at an additional cost too. The kit includes a Sunrace MS rear derailleur, actually a 10,11 or 12-speed compatible unit, a Sunrace MZ 12-speed trigger shifter, Sunrace CN12S 12 speed chain and a Sunrace CSMZ90 11-50t 12-speed cassette. We’ve already reviewed an 11-speed Sunrace cassette with a 50t big ring and found it to be a great piece of kit offering similar performance to Shimano or SRAM cassettes only for much less money. The Sunrace cassette also fits a standard Shimano HG freehub too, so no compatibility issues there. The retail price of the Sunrace 1 x 12 MS Shifting Kit is around £285.00, however, we’ve spotted the complete kit online for just £202.96 at Vanilla Bikes (affiliate link). SRAM NX Eagle is SRAM’s most affordable 12-speed system. For 2019 SRAM, the originators of 12 speed, upgraded its entry-level NX groupset to Eagle spec which means 1×12 for cheap! An SRAM NX Eagle groupset includes almost everything to refresh your drivetrain and upgrade your bike to 12 speed. This option which we found on Chain Reaction Cycles, costs £250.99 significantly less than the RRP of £365.00. 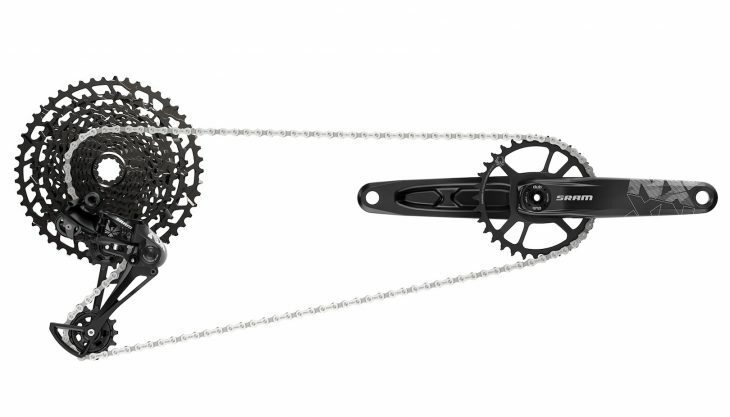 It includes an SRAM NX Eagle DUB Boost chainset with X-SYNC chainring, SRAM NX 12 speed shifter, NX 12 speed Eagle rear mech, SRAM 12 speed chain, and 11-50t 12-speed NX cassette. Unlike other SRAM Eagle groupsets, the NX Eagle cassette fits a standard splined freehub rather than a dedicated SRAM model. Two things to note is that we’re not sure this groupset bundle comes with a bottom bracket or not, you’ll need a DUB BB for the chainset to fit, plus this is s Boost drivetrain so ensure it suits your frame before buying. We’ve already ridden and reviewed SRAM NX Eagle here and were very impressed with this budget 12-speed drivetrain. 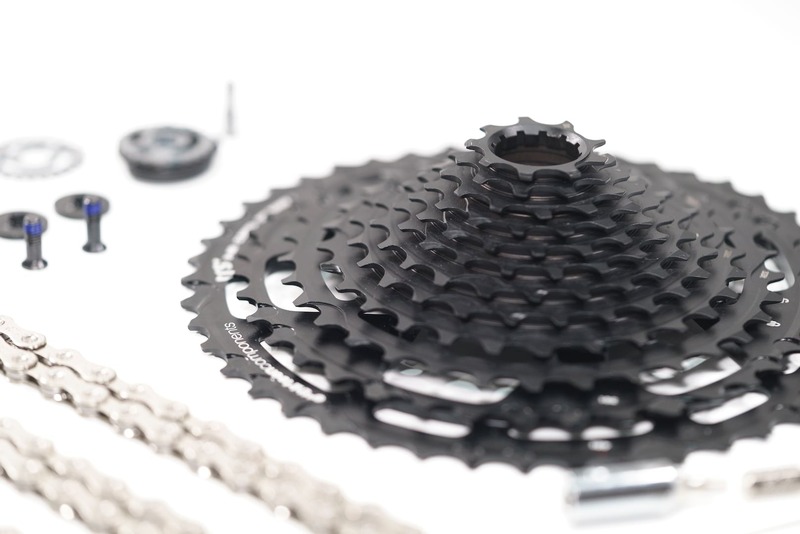 E*13 TRS 12-speed cassette comes with the kit for a claimed 511% range. Whereas the Sunrace and SRAM NX systems replace your current 10 or 11-speed drivetrains, the E*13 TRS Plus system actually upgrades your 11 speed SRAM system to make it compatible with a 12-speed cassette. This is a much more involved, and we imagine fiddly upgrade to the other options too, and actually requires the 11 speed SRAM shifter to be dismantled and have new internals fitted. The good news is that it comes with a 12-speed E*13 cassette and 12-speed chain, plus all the tools you will need to perform the upgrade. The bad news is that we can’t find the E*13 system for sale in the UK, it will only work with 11 speed SRAM systems, not Shimano, and you may still need a new chainring too. U.S pricing for the E*13 TRS Plus 12 speed drivetrain upgrade is $299.00. Do you know of any other cheap 12-speed upgrade options? Do you plan on any of the above upgrades or have you already upgraded? Let us know your thoughts and ideas in the comments section below. 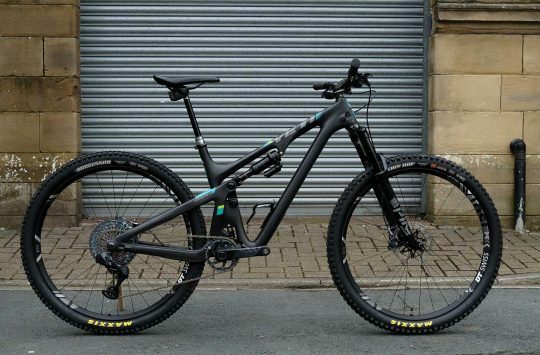 Cotic Brings Manufacturing To The UK With 2019 Cotic RocketMAX. Full Details. UBYK stock the E*13 9-46 cassette, they’d surely be able to order the E*13 kit in? 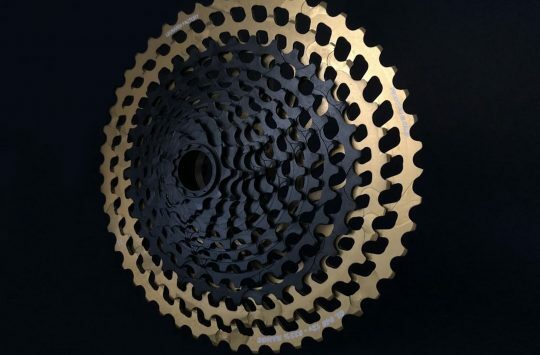 11 speed 11-50 cassette from Garburuk. Light as Sram X01 11sp with a full range but without the cost of mech and shifter . Is the sunrace 12 speed cassette compatible with the SRAM stuff? @swoosh I’ve not tried the 12 speed cassette but I believe the 11 speed works. I fitted the Sunrace 11 speed 11/50 cassette to my Shimano 1×11 xt setup and away you go good as gold . I got the idea off you guys ,so that must be the cheapest way ? (as long as you don’t want the 10 tooth top gear) let’s face it how many times will you feel the benefit? I have 20 gears (2×10). How is spending more money to run only 12 gears AN UPGRADE?